With the innovative 5-gear transmission adapted optimally for cross country use, the XC models are in a class of their own. The Magura hydraulic clutch saves power on long rides and the reverse gear is extremely practical on the track or trail. The Keihin carburetor has been proven multiple times in racing. This 39mm carb’s Throttle Positioning System guarantees a uniform, forceful power delivery in all speed ranges. Packed in a space-saving manner into the free space behind the cylinder head, the small, lightweight electric starter motor is ready for use. 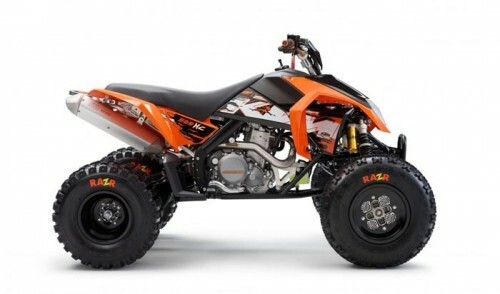 It brings every KTM ATV up to speed reliably and comfortably even when racing becomes hectic. When designing the tank, KTM focused heavily on two aspects: volume and shape. The XC tank holds approximately 3.35 gallons (13.4L) of fuel to ensure an enormous operating range. The fuel tanks comfortable shape allows the rider to easily maneuver around the tank to ensure quicker cornering time. High-grade Ohlins spring elements designed for the hardest all-day Enduro racing are standard equipment – front and rear. Adjustability guarantees optimum tuning for the widest variety of terrains. 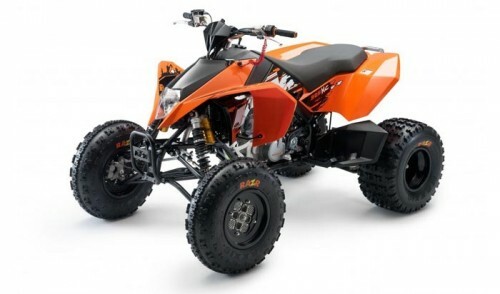 A further highlight, the spring travel which at 10.8 inches (275 mm) front and 10.7 inches (272 mm) rear sets the trend for the Enduro ATV! Outstanding riding performance requires absolutely top-specification brakes, such as those from Magura. At the front, a 4-piston brake with a fixed caliper (unique in the ATV field) grips two enormous 180mm wave disks. Highly resilient braided streel brake lines at the front. The extremely durable chromoly steel A-arms can take the hardest professional cross country use. They have high-grade needle-roller bearings, are adjustable in camber and caster and can be easily exchanged. 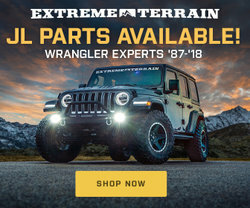 The rear axle is tapered, made of high-strength steel and allows for a variable rear width of 45 to 48.5 inches (1,076 to 1,148 mm). Amazing features come standard on the XC models including: An ultra-durable, tapered aluminum Magura handlebar with four adjustable positions, extra-wide serrated footpegs, engine stop tether switch, extremely light aluminum silencer, Maxxis Razr tires on light durable DWT aluminum rims, aluminum subframe, high-strength, powder-coated chromoly steel frame and a curved radiator for maximized cooling efficiency.